Scanning the online news last evening I viewed with some dismay the sad story of Notts County’s Manager and former playing hero, Ian McParland. I’m pretty well disposed towards ‘Charlie’, I watched him from the Meadow Lane terraces on many occasions when his hugely impressive goal-scoring output made him an enigmatic and revered figure to the black and white faithful. Those days brought him many plaudits in local football of the era – not least when Brian Clough attempted to sign him for the high-flying Nottingham Forest of the day. Notts County vetoed that career move for the man from East Lothian and it seems that history now repeats itself in the way they treat this man with the blood of the game running through his veins, as they unceremoniously dump him from the Meadow Lane managerial role. I have to confess here, I’m a little angry about this decision. I follow Notts these days as merely a (slightly intrigued) observer but I feel a wrong has been done here. I also feel that Sven and/or whoever has made this crass decision may have misread the public’s attitude towards what they are attempting to achieve at Notts County and the methods they are employing in going about that. I managed to catch the last home game at Meadow Lane before Ian’s parting of the ways with The Magpies – a 2-2 draw against lowly Torquay United, and observed at first hand, the Notts ‘revolution’. It’s been many a year since I watched Notts but believe me, and stay with me please, I have extremely good historical credentials of watching this club’s games. I’d very much like the club I watched so many times in my youth to progress and make headway back up the divisions like I did with so much glee all those years ago. What I witnessed during last Sunday’s game was a team with huge expectations hanging over them – perhaps not surprisingly – but an attitude and atmosphere in the stands that seemed little galvanised by the momentous happenings at the club during the past few months. There were good things about the Magpies’ display but the whole experience seemed a little disjointed and ‘unreal’ at times. What was notable was that Ian McParland was right down there by the touchline, passionate as ever and urging his team forwards. Things didn’t work out on Sunday and for Ian McParland, although we didn’t know it at the time, it was Endsville, Arizona. Notts County moved into fifth place after this slightly frustrating game nevertheless and the fact that Notts have chosen this time and context to dispense of his services speaks volumes. It seems as though they were seeking a window of opportunity in which to part company with Charlie and that this appeared to be their first reasonable chance to do so. In my humble opinion they have made a huge mistake. There is a principle here. Very recently we have seen Sol Campbell leave the club under slightly dubious and slightly ridiculous circumstances. There was a healthy lesson to be learned here. Are Notts to continue with the notion of ‘buying up’ the division they presently find themselves in? 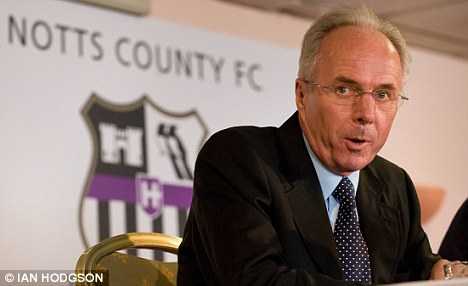 Sven-Goran Eriksson I can view as a very notable and expensive exception in the way he has raised Notts County’s profile but to continue with the strategy of buying, buying, buying way above their League Two station is folly I feel – tempting indeed but ultimately folly. When I watched the Notts lads performing last Sunday I was trying to imagine some of the stellar names that have been mentioned in Notts circles actually appearing at this level on the in the black and white stripes. You know what? As much as I tried to picture this fanciful and seemingly attractive proposition, it just didn’t feel ‘real’. I’m going to offer that same notion for Notts’ choice of a new manager to replace McParland. Another ‘big’ name will not necessarily cut it I don’t believe. In Ian McParland, Notts had the perfect man to in which to project the way that they were going to build steadily, with common sense and with one eye on keeping the fabric of the club’s progress believable and acceptable. They have failed in this regard in their dismissal of the man. What’s worse is that I don’t believe that in their ham-fisted and increasingly vulgar way they even realise that. 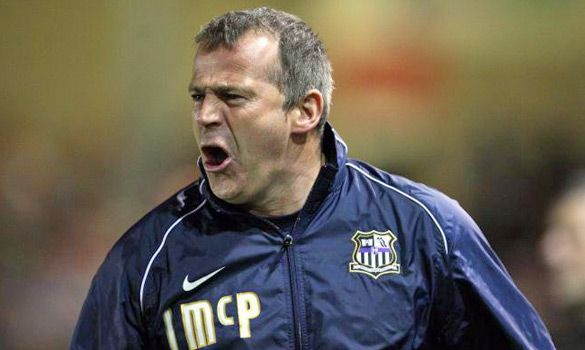 Ian McParland has achieved an awful lot over the years in the cause of Notts County. Through several denuded and impoverished years he managed to make them into a ‘proper’ football club again, with a decent infrastructure and an attention to youth that had sadly been lost. He can hold his head up and know he did a superb, dedicated and dignified job at Meadow Lane, operating at a very lowly level. I hope at least that somebody remembers this whilst the ‘filthy lucre’ seems to hold the whip hand at Meadow Lane. It’s the end of an era now. I watched the local news on the TV tonight and saw Ian ‘Charlie’ McParland driving off into the sunset in his smart silver Lexus with a few misgivings and some happy memories, no doubt. His former club are now free to get on with courting some outlandish name such as Roberto Mancini or suchlike I really hope he surfaces in another managerial position very soon and believe he will. Ian McParland is a football man of quality and deserves much better than this. Surely this was always on the cards from the minute Sven walked in? I said at the time that this was comparable with Alan Sugar or Richard Branson taking over the corner shop and not wanting to be in charge. Like you, I think it’s sad but football is big business these days and there no longer seems to be any room for sentiment. Yes on the cards, realistically I agree. For me that doesn’t make it palatable or ‘right’ though. The fact that football IS big business these days attracts many but also disenfranchises lots of people too. I’m not really interested in big business, I guess that’s why my interest in football is equally on the wane. I hope the ‘suits’ have it right and that they don’t completely ruin football in the process. I have my doubts though. I don’t think Ian McParland was part of the plan, and I expect he knew that from the moment the takeover happened. That alone would account for much of his recent demeanour. It would have been more honest, but perhaps not practical, if the new owners had come in and told him that they didn’t see him being of the right calibre to carry out their grand plan. You’re right in saying that he did a lot of good things around the edges, but few would say that he was a good manager based on team selections, tactics, ability to motivate and above all win matches. I agree with you that the new owners took the first opportunity they could to sack him. From their point of view, I guess they could see that a certain amount of success could come in the short term on account of the acquisition of quality new players. How much harder it would have been to sack him if his team was leading the division, which it may well have wound up doing. That still would not have made him the man to march Notts up the leagues though, would it? Where I think they have the problem is in finding someone who can. They’ll be very lucky to get that right first time, if ever. Totally agree. That his dismissal was both wrong but also inevitable. I will be very surprised if they can find anybody better who can achieve their short term aim of getting them in the top two this season. Bet they end up waiting at least another season. Frankly it doesn’t leave Eriksson looking very good. Accusations that he was only in it for the money seem more than fair. “Hey Sven, how about doing some nebulous management job for this wee club in Nottingham down on its luck, but we can’t pay you through the club, we’ll just give you this even more nebulous role with an entirely unrelated mining company and that’ll see you right…” The degree of financial chicanery going on here makes Ken Bates look like a bumbling incompetent. Hi Fraser, hope you are well mate. Yes, all true, but I don’t think many of the great Nottingham footbaling public (from either side) were under any great illusions about Sven’s ceaseless quest for the filthy lucre. There could never by any much other great motivation for him washing up at Notts County, despite protestations about ‘the project’ etc. I thin what has to always be born in mind here is that Notts have quite regularly been in a perilous state over the past decade. Their fans haven’t seen them splash more than ten grand on a footballer in that time. It could be argued that they had little to lose with the surfacing of this Munto mob and Svennis. The article mentions Peter Trembling’s ‘buyout’ for a quid and this is where it becomes even more confounding and confusing to me. There are statements coming out about ‘new investors’ subsidising the club in Munto’s supposed absence (and I’m not convinced about the latter either!) Some reports state there may have been a further investigation into Munto Finance imminent and it has been put forward that Trembling’s take over is but a front. I have no idea about that but what I do know is that retaining Sven and to some extent an expensive signing such as the goalie Kasper Schmeichel will take a lot of money and a lot of replacement investment to cover it.